as ek jou kry, slaat ek jou dood. Doodlebugs, joerie, shunties, toritos—these are but a few of the many colloquial names given to amusing little creatures that many people know simply as antlions (or translation of such) (Swanson 1996). Larvae of winged insects resembling (but unrelated to) dragonflies, they are best known for their habit of digging smooth-sided, cone-shaped pits in sandy soils and concealing themselves under the sand at the bottom. There, they lay in wait for some small, unsuspecting creature—often an ant—to fall into the pit. When that happens, the hidden antlion bursts forth, using its oversized, sickle-shaped mandibles to “flick” sand at the prey to keep it sliding towards the bottom of the hole. Once it is within reach, the antlion grabs the prey using those same, deadly mandibles (how delightfully morbid!). So otherworldly is their appearance and behavior that, in addition to inspiring children’s charms, they have served as an unmistakable model for the “Ceti eels” featured in Star Trek: The Wrath of Khan!1 Adults of this group, on the other hand, have inspired far less imagination in nomenclature and culture, to the point that even their common name “antlion lacewing” is merely a reference back to their unusual larvae. Even the scientific name of the family—Myrmeleontidae—has failed to garner complete adherence, with “Myrmeleonidae” (who needs the “t”?) and “Myrmelionidae” (perhaps from English-speakers focused on the English spelling of “lion” rather than the Latin spelling of “leo”) still appearing in popular and even scientific literature. I’ve seen antlion pits on several occasions (especially in recent years as I’ve spent more time in open sand habitats searching for my beloved tiger beetles). 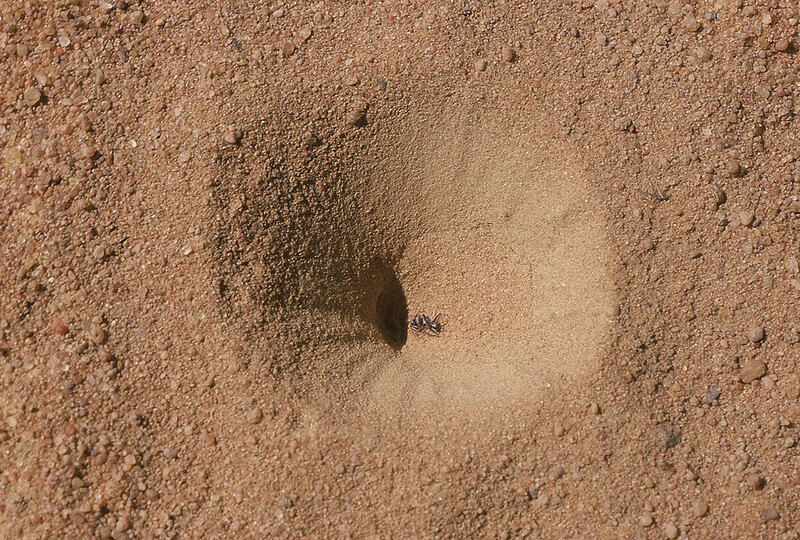 However, the pit pictured here—encountered at Borakalalo National Park in South Africa’s North West Province, was the first I’d ever seen in which there was actually an ant inside the pit. The ant was dead, presumably having already been sucked dry by the joerie. 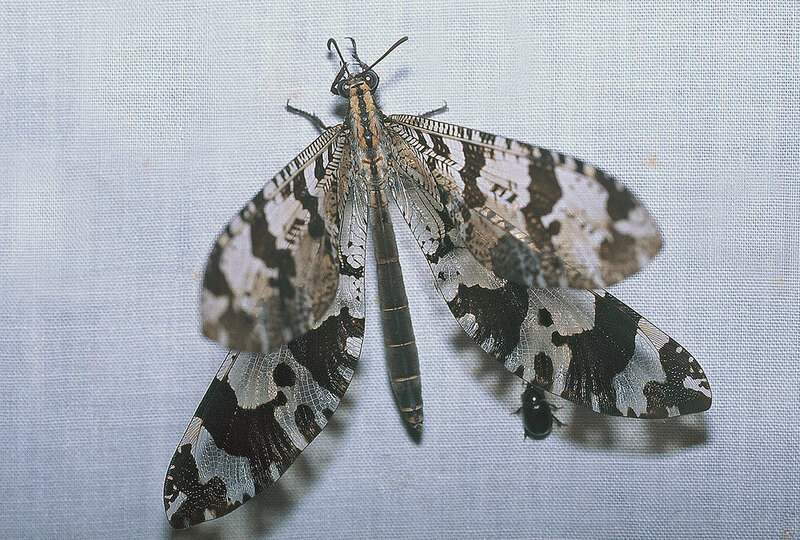 I didn’t know it at the time, but southern Africa is a major evolutionary center for antlion lacewings and some of their striking relatives such as spoonwinged and threadwinged lacewings (family Nemopteridae) and silky lacewings (family Psychopsidae) (Grimaldi & Engel 2005). Relatively few of South Africa’s antlions, however, actually dig pits—a habit restricted to species in the genera Hagenomyia, Cueta, and the cosmopolitan Myrmeleon (Scholtz & Holm 1985). Rather, the majority of species have free-living larvae that hide under objects or roam under deep sand from where they emerge to hunt other insects. We know nothing about P. lentus, except for distribution records. Nothing is known about its larva or biology, although the larvae of all Palpares and related genera are obviously large, and live freely in sand well concealed and almost impossible to find. Palpares lentus is one of 42 species of Palparini in southern Africa—half of all known species in the tribe. Nearly two-thirds of them are endemic to “open” biomes in the dry western parts of the subregion (Mansell & Erasmus 2002). This high level of endemism results from the occurrence of large tracts of sand and exposed soil that are conducive to the large sand-dwelling larvae. Eastern parts of the subregion containing forest or thicket biomes are not as favored by antlion lacewings, and consequently the diversity of species in these areas is much lower. Because of their great size, palparine adults are especially vulnerable to predation, with the result that they have evolved elaborately patterned wings to enhance their camouflage—apparently an adaptation to the dappled shade provided by the fine-leafed plants found in these biomes. While many species in the tribe are diurnal, a few in the related genus Palparellus pulchellus and P. ulrike are known to be attracted to light, spending the day resting concealed amongst vegetation. The attraction of this individual to our ultraviolet light suggests Palpares lentus has similar habits. Everything you want to know about antlions can be found at Mark Swanson’s excellent website, The Antlion Pit. For information specific to Africa, Mervyn Mansell has assembled a checklist of The Antlions (Neuroptera: Myrmeleontidae) of South Africa, and a nice summary of antlions in Kruger National Park by Dave Rushworth can be found at Destination Kruger Park. I thank Dr. Mansell for his identification of Palpares lentus. Grimaldi, D. and M. S. Engel. 2005. Evolution of the Insects. Cambridge University Press, New York, xv + 755 pp. Scholtz, C. H. and E. Holm (eds.). 1985. Insects of Southern Africa. Butterworths, Durbin, South Africa, 502 pp. This entry was posted in Myrmeleontidae, Neuroptera and tagged antlions, crypsis, entomology, immatures, insects, nature, predator avoidance, science, South Africa. Bookmark the permalink. I remember those antlion pits fondly, and trying to get the strike by twitching a grass stem on the pit wall. Is that a little scarab in the picture? A fantastic article Ted and pictures. The response from Mansell is what I was talking about earlier on in my e-mail, there is hardly any information around on a great percentage of our insects and it is very frustrating to me. It seems as if no one is interested in doing research here on anything other then just the most popular and easily seen insect. Take for example the Owl Fly I posted today, nowhere can I find more than the couple of lines in the field guide and I would dearly love to be able to answer the peoples questions on it which they have posted. Maybe I could ask you to do that for me Ted? Thank you for having such informative articles always. I really do look forward to seeing what you are going to post and of course the articles of things found in SA are especially interesting to me. anon – Yes, it is a scarab – perhaps Hybosorus illigeri, which I seem to recall collecting at that location also. If not that, then perhaps some type of aphodiine (which I’m not too keen on – Agrilus and Acmaeodera satisfy my “difficult genera” quota). Joan – Mansell’s response about Palpares lentus can be said for the vast majority of insects across all taxa, with only the relatively few more popular groups coming close to having had their biology studied in any detail. Too many insects, too few entomologists! I’ve added some information in the comments to your latest owlfly post, and I’m envious that you were able to actually get photos of the larval form for your antlion post. Adrian – I never thought of tickling the burrow with a grass blade – I’ll have to give that a try. We have antlions in the sandy pine woods of Kisatchie National Forest in Louisiana. They create these little kingdoms, large areas of pits all over the place. I’m glad to know real entomologists call them that too; I thought it was a name my mother made up. Thanks for your kind words, additional info and brilliant links Ted. Once more it is greatly appreciated. The thing about calling these guys “antlions” is that they really don’t hunt *anything* like full-size lions do. Unless there are some lions somewhere that dig pits and wait for people to fall into them, that somehow nobody has told me about up until now. Last fall, we had three of the larvae in a basin of sand in the kitchen, and we found that the reason why you don’t see ant corpses in the pit is because, when it is done, the antlion flicks its head and throws the withered husk out again. They throw the corpses quite a way, up to 4 or 5 inches. I thought it was a name my mother made up. tceisele – I was wondering how they got rid of the carcasses. I figured maybe they dragged them into the sand for feeding and then left them there. This one must have just finished his meal.